This is my update for work done for the GNOME Foundation during the weeks of September 14th and 21st. I spent a lot of my last week communicating with lots of people. (At one point I had three IM windows open in addition to my email conversations and IRC and the phone rang!) I’ve captured the results of some of those conversations below. Hopefully the other conversations will also prove as productive soon. Two one on one meetings with Brian Cameron who is the board member who works most closely with me on goal planning and results. (This is to alleviate any confusion from having seven bosses, to make sure things move quickly and to keep me from filling their email boxes any more than I already do!) In one meeting we went over the last six months and year’s results. In the other we talked about current issues and plans for the next couple of weeks. Board of Directors meeting. We held our regular board of directors meeting, you can find the minutes online. Women’s mini-summit. I attended the FSF’s Mini-Summit for Women in Free Software. Unfortunately I was on the phone instead of there in person but there were several other GNOME women in the room like Marina Zhurakhinskaya, Mairin Duffy and Leslie Hawthorn. We came out with some concrete plans for the future and a mailing list for everyone interested that’s already active. Interviewed with Bruce Byfield about the women’s minisummit. Reviewed German’s excellent written summary and explanation of the 2010 budget. It’s all ready to send out. Got list of patents from OIN. Also got advice that it’s not in our best interests to review them. I attended and was interviewed on Linux Link Tech show. Wrote Software Freedom Day press release. Had a couple of follow ups with Dave Neary and Vincent Untz about OSiM. Thanks to both of them for representing GNOME there. Thanks for Vinicius for making a GNOME Mobile member sign and to our GNOME partners that displayed them in their booths, Igalia and Codethink. Proposed a marketing hackfest. There is interest, now we just have to figure out a time and a place we can all meet. Proposed and got enough takers to do a women’s issue of GNOME Journal. An issue written all by women about what they are working on in GNOME or about things they find interesting in GNOME. It’ll come out in November. Proposed that the a11y team branch out to non software conferences to spread the word about GNOME and how it can help people with accessibility needs. Did some twittering on behalf of GNOME. Proposed CiviCRM for a CRM system for the GNOME Foundation. Followed up on 401K plan. Only step left is a signed document and a check from Rosanna. Attended the GUADEC IRC planning meeting that Srinivasa Ragavan put together. Thanks to all the previous GUADEC organizers that attended – there was some really good information shared during that 2.5 hour meeting! Srini is going to post the logs. Was disappointed that the invitation to GNOME to attend the 2nd International Symposium on Computers and Arabic Language fell through. Khaled Hosney, Seif Lotfy and others were working to make sure that GNOME was represented. It sounds like they are no longer interested in funding free software projects though. I think it still might be worth having someone from GNOME attend though. Sent thank you’s to everyone who donated to GNOME. Helped with the promotion plan for GNOME 2.28. And although I didn’t do it, I think it certainly worth mentioning that GNOME 2.28 released! Monday was a US holiday. Met with a company interested in using Linux and GNOME. (Actually using it but not as much as they’d like.) They had a lot of feedback for us and we talked about ways that they could get that type of feedback directly to the projects. One of the main issues was knowing where to submit bugs. They submitted a lot of bugs to the Linux distributions. Then they’d be told to resubmit the GNOME ones to the GNOME project … it would help if we could just forward them along to the right place. Talked about upcoming events at the GNOME Advisory Board meeting. Mario Behling and Emily Chen talked about the GNOME.Asia Summit. Daniel Siegel and Seif Lotfy talked about the Zeitgeist hackfest and John Palmieri talked about the Boston Summit. Worked on 2009 waterfall chart and 2010 budget with German. It is now ready to share with the board of directors and then board of advisors and the Foundation list. Talked to several people about OIN’s announcement about purchasing 22 patents from Microsoft. OIN is supposed to post the actual patent numbers. Talked to Willie Walker about GNOME accessibility. Met with Ruthe Farmer from the National Center for Women & Information Technology. They do studies about women in technology and publish best practices for how to encourage more women to take technology jobs and to stay in them. They would like to do a study around women in free software. They have recently written a study about the Culture of Open Source Computing (pdf) that points to a lot of resources about women in open source and developer motivations in open source and you can find their reports online. Sent thank you letters to people who donated to the GNOME Foundation during the week. Started studying Ford Foundation website to understand what types of programs they give grants for and how we might find a good fit for GNOME projects. Followed up with an advisory board member who hasn’t paid 2009 fees yet. For this week. This is not the list of all the things I have to do but rather what I want to do this week. Work on requirements for a CRM system so that sys admin team can install one. Follow up with potential sponsors. Follow up on 401K plan. Follow up with International Cooperation, the group in Gran Canaria working with developing countries. Fill out (draft for) form for applying for a Ford Foundation grant and run by appropriate GNOME mailing list. Make sure that plans are in place to have a new US event box and get it to Utah Open Source Conference. Finish following up with advisory board members whose 2009 payments haven’t come in yet. If you measure productivity based on what gets done (as opposed to how hard you work), this was a frustrating week. Got some feedback on financial waterfall. Followed up with end user looking to use GNOME and GNU/Linux and running into problems. Continued to push for Q3 quarterly report to be done. Pinged sponsors and potential sponsors. Pinged people holding up 401K setup. Pinged press team to get started. Met with Denise to talk about how the customer success stories are going. Met with Keith from the Open Invention Network to talk about how OIN and GNOME could work more closely together. He’s looking for the community to help find prior art and to be advocates for them. Posted Friends of GNOME August results. Send finances out to advisory board. Make sure press team takes off and starts working on some tasks. Follow up with adboard members who are missing payments. Fill out form for applying for a Ford Foundation grant. … and a bunch more stuff that will have to wait until next week. In the month of August we raised $1,212, for a total of $21,695 since January 1, 2009. We made several improvements to our Friends of GNOME site, including the ability to specify your monthly donation amount. 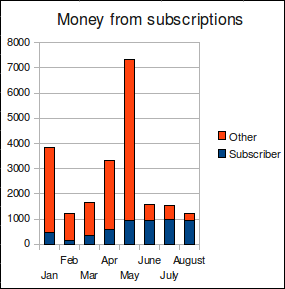 Money from subscriptions held steady. 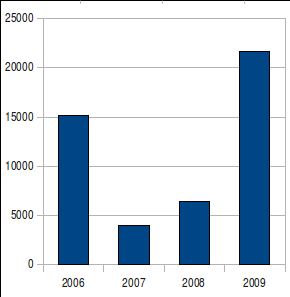 August 2009 was better than previous Augusts, thanks to the subscriptions to Friends of GNOME! 2009 is our best year yet and getting better.